Going to the gym and working out regularly might be an easy process if you’ve settled into it and you’ve grown accustomed to the routine, but it’s not so easy if you’re someone who’s just getting started. The sheer amount of different fitness programs and paradigms is intimidating, and trying to find the knowledge about what’s “right” for your potential regimen can be a difficult and confusing process. It is made all the worse by several myths that have long been perpetuated about fitness and working out. As fitness experts and gym owners in the Allen, TX area, we know a thing or two about workout gyms, exercise programs, and how to be healthy. Whether you’re a newbie that’s looking to start new habits or a veteran of daily exercise, make sure that you’re not being duped by these fitness myths! 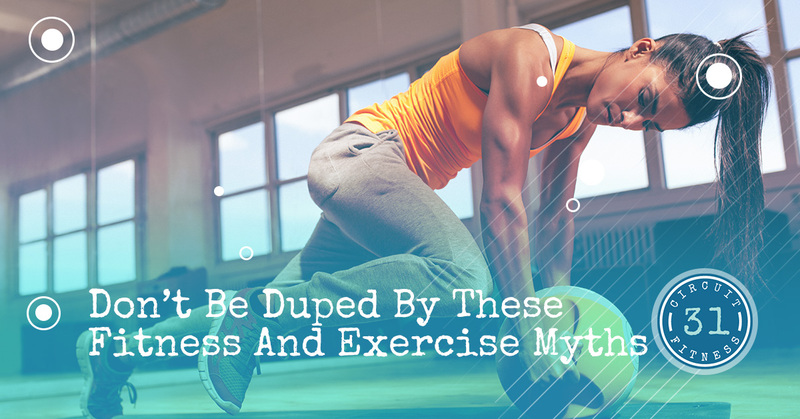 This myth is especially ubiquitous among people who have insecurities about their fitness level. Whether you’re overweight or just downright inexperienced, it’s easy to feel like people are giving you the stink eye at the gym, or laughing at you behind your back. While we can’t speak for everyone all the time, we’re confident when we say, in the overwhelming majority of instances, experienced gym patrons aren’t there to look down on other people. In fact, workout culture has a very optimistic and positive mindset — it’s all about improving yourself and leaving your vices behind. Again, there are occasions where this is not true, but the reality is that hecklers and jerks are, in fact, exceptions to the rule — the majority of gym goers are more interested in building each other up. For decades, cardio workouts have been the undisputed king of weight loss programs. The idea was that, since you’re burning more calories, you’ll lose weight faster. Modern findings have found that this isn’t necessarily true. While you will, in fact, create a calorie deficit by doing consistent cardio workouts, that’s about all your doing. If you want to accelerate your weight loss, engaging in an equal amount of strength workouts is the best way to do this. Muscles burn more calories when they’ve been worked hard, and strength workouts also improve your metabolism, which allows for a higher “passive” calorie burn for up to 38 hours after a single workout! The bottom line is that choosing one workout over the other for weight loss is folly. Cardio and strength workouts should be done in equal measure, and this is why new workout programs have surfaced that combine them together. At Circuit 31 fitness, our circuit training program will give you a hefty cardiovascular workout and ample strength training, all in a very manageable 31 minutes! This myth is destructive for a few reasons. First off, the perception that you need to do marathon workouts leads a lot of people to feel like they can’t make time for it, leading them to skip the workout out altogether (a little bit of exercise is better than none, people). Secondly, research has actually shown that longer workouts are counterproductive to most fitness goals. At a certain point, stressing your muscles too much just leads to a longer recovery time, which keeps you out of the gym longer, and diminishing returns are a real thing — there’s only so much you can do for your body in one day. This is why a lot of modern workouts have shifted to faster, harder programs; the body benefits from shorter workouts that are more intense. If you’re in or around the Allen, TX area and you’re looking for a nearby gym, try our circuit training program at Circuit 31 fitness! You’ll get an amazing workout in half an hour that leaves you better off than a long two-hour session would. This myth can sort of be true from a certain point of view, but it really depends on what your goals are. For most intents and purposes, no amount of physical activity can compensate for a bad diet. If losing weight is your main goal, food is arguably much more important than exercise. If your goal is building muscle, you’re not doing yourself any favors by eating junk. Some people have found that, by exercising hard, they’re “free” to eat junk without the fear of getting fat. This is sometimes true (you can theoretically prevent weight gain if you’re burning enough calories to offset the bad food you eat), but it’s more preventative than proactive. If you have poor eating habits, vigilant exercise can be a good way to not make your weight worse, but if you want to actually improve, lose weight, and build muscle, you have to start eating well. Never underestimate the importance of a diet. While weights have been the go-to method for strength training for years, we’re in a wonderful age now where all kinds of diverse and innovative workout methods have come to light. There are many who feel like they don’t need gyms because they’re not doing the traditional weight/machine workouts. Alternatively, they feel like a gym isn’t necessary because they want to do cardio. In reality, modern gyms are equipped with all kinds of equipment that facilitates nearly every kind of workout. Yoga, Pilates, cardio, interval training, weights, machines, stretching, and more are all options that you can pursue at a gym. You absolutely aren’t limited to traditional weight-based strength training, so don’t let this myth fool you, and find your closest gym nearby today! Circuit 31 fitness center is proud to serve the people of Allen, and our gym is designed around the very idea that workout routines should be filled with diversity. If you’ve fallen for this myth, give it a second thought and consider coming in today! There are always a million excuses not to do something, and these myths make up at least a few of them. When it comes down to it, the only way to start making positive changes in your life is to just get up and start! At Circuit 31 fitness center, our goal is to help people do just this. Our circuit training program is designed to be doable and friendly for both new gym patrons and elite exercise veterans alike, and can also be done in a mere 31 minutes, ensuring that you don’t have to take a huge chunk of time out of your day to meet your fitness needs. If you are in or around the Allen, TX area, stop by or contact us today!